I thought that it would be more realistic if not every Pregnancy lasts exactly 72 hours, with this mod installed pregnancies will gain a lot more flexibility. You can set the Pregnancy duration in hours, starting as low as a one hour pregnancy if you so desire. The mod comes also with a Pregnancy Breastgrowth option that allows you, (when activated) to simulate the changes to the body during pregnancy in a more realistic way, these changes are applied with each hour the pregnancy progresses. All of these Features can be customized by you any time in game ! -Back up your Save before installing/running the mod ! 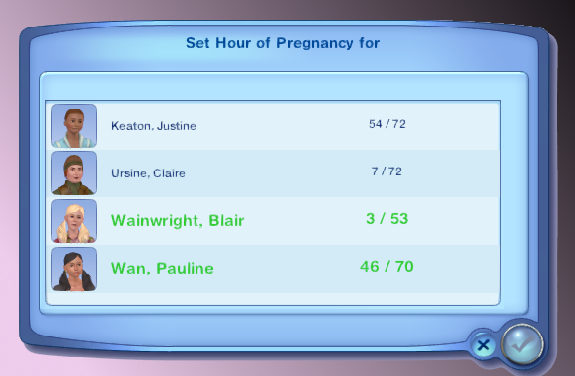 Example: Setting the Pregancy Duration to 50 and the Pregnancy Duration Variation to 5 will result in Pregnancies with a duration from 45 to 55 hours, so while one Pregnant Sim may have her baby at 48 hours another Sim's baby may be born after 54 hours. So if a Fairy and a Human are trying sucessfully for a baby the mod chooses a pregnancy duration for either Humans or Fairys. To prioritse one Simtype over another there is the Pregnancy Priority list where you can set a Priority for each of the aove stated Simtypes. So if you set a higher priority for witches than for humans and a witch and a human have a baby the pregnancy duration will be the one for witches. During pregnancy the female breast grows to accommodate for feeding the baby. If you activate this option not only the Belly of your Sim will grow ! The growth starts with the first hour of the pregnancy and reaches its maximum at 32 hours. After the sim gave birth the new breastsize will stay for 24 hours and then shrink to its original size within 8 hours. Customize if you like ! If setting the lenght and lenght variation of Pregnancies isnt enough go advanced and set these parameters for each Pregnancy type e.g for Pregnant Fairys, or go Fancy with the Expert Settings and create your own custome pregnancy progress table ! If you want/need to Unistall the mod there is a special option in the Menu of the mod, use this if the mod has already modifed Pregnancies for a good clean result. After this process has finished the mod will deactivate itself, you then can save the game and delete the package after exiting the game. The great Scripting Tutorials here on Modthesims from Buzzler, BailaBaila99 and CmarNYC . Thanks to the creators of SimPE (Inge & Peter L Jones)!